A new-born baby is a source of immense pride for every parent. They also represent a great deal of hard work and no little amount of sleep deprivation – the term baby bags can be equally applied to the dark circles under mum and dad’s eyes as it can to the sleep sacks that keep the little one snug as a bug in their cot. Even for the most dedicated runner, the first few weeks are unlikely to provide any window for slipping on the shoes and clocking up a few miles. The attentions of family and friends may mean a few hours respite here and there from feeding and changing, but any time off is most likely going to be used to catch up on lost sleep. A few months into bringing up baby, however, and a routine will be set in stone and the body will have adjusted to the demands of an extra mouth to feed. Now is the time when a runner can get back on track and begin to regain their lost fitness. For parents on a tight schedule, a jogging stroller represents the ideal way to dovetail their love of sport with their new responsibilities. It also makes a refreshing change from the four walls that they have become overly familiar with. There are a number of models on the market, so it is a good idea to shop around and ask as many questions as possible. Areas such as the safety harness and the positional options of the stroller – to allow baby to be more upright or lie flat, for example – should be examined thoroughly, along with the unit’s suspension capabilities, to prevent any sudden bumps that may wake up the little one from his or her slumbers, storage capacity for baby's essentials, and the overall weight of the unit. A safety leash is another great idea, attaching parent to stroller and preventing the possibility of problems if one loses one’s grip through, for example, a sweaty palm. As with every runner getting back on the move, don’t be tempted to go too fast, too quickly. Take account of the inevitable decline in your fitness that the two- or three-month break has resulted in. 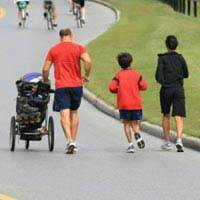 You’ll also have to get used to steering the stroller while you run, too, so easy does it on the first few trips out. Don’t forget the aforementioned essentials needed to keep baby happy, either. So that means packing wipes, nappies, blanket and a bottle. Your mobile should be along for the ride as well, because if baby can’t settle and you are a mile or two from home, it may be prudent to call in the cavalry in the shape of your partner or relative to pick you up in the car. If you prefer not to run solo, it may be possible to buddy up with other new parents in the area – not only can their company make the miles fly by, but they can also be a useful source of tips on child care. The comfort to be gained from swapping experiences of the first few, stressful, months should not be underestimated. It is vitally important that parents remain as fit as possible in order to perform the multitude of tasks required to keep baby happy. A jogging stroller offers mum or dad a route back to full fitness while the little one never misses out on his or her regular glimpses of the big wide world.